The parcel of land located at 1643 Brickell Avenue may be the most historic plot located along the former Millionaire Row in Brickell. The Santa Maria lot sits atop what is considered high ground in Miami. The former home sites that sat on this parcel of land were generally located at the high point of a ridge along Biscayne Bay. Given high tides and the proneness for flooding, a high ridge was an attractive spot to build a home. Occupation of the Santa Maria lot can be traced back to 1805. The tract of land was the home site to early settlers prior to Florida becoming a part of the United States. Land on both sides of the Miami River were titled through grants issued by the King of Spain during Florida’s second Spanish Period (1784 – 1821). One of these grants would convey ownership of the Santa Maria lot to a Bahamian family that arrived in South Florida during the 1790s. Charles and Frankie Lewis had migrated from the Bahamas to southeast Florida during the 1790s. The family settled along the New River of Fort Lauderdale. They had two sons who were approaching adulthood around the turn of the century. William Lewis, the older son, got married and moved south to build his home along Biscayne Bay, south of the Miami River. The land he and his wife chose was the location that would later be known as the Santa Maria lot. William and his wife Mary built their home on a bluff. The home sat at the top of the ridge. They also provided for a makeshift staircase to navigate from the top of the bluff down to the bay. The stair steps were carved into the limestone along the ridge. The Lewis homestead was filed by his wife Mary. She was granted a 40-acre deed by the King of Spain in 1805. Mary went by Polly, and the land grant is associated with the Polly Lewis name. It was unusual for a land grant to be filed by a woman at that time, so some historians have speculated that William Lewis may have passed away prior to 1805. William’s brother Jonathon received a similar land grant in 1813. Jonathon’s grant was just south of the Polly Lewis grant. It was just eight years later, in 1821, when control of Florida shifted from the Spanish to the United States. In 1825, the United States formally recognized the Spanish land grants in the form of what the US government termed “donations”. Donations meant that the grantee officially owned the deed to the land defined in the agreement. Polly’s land donation was formally assessed at 634 acres as part of the land grant conversion by the US government. It would include not only what would become the Santa Maria lot, but also much of the Brickell Hammock area that would later become the Road’s neighborhood. The Jonathon Lewis donation consisted of 613 acres. It included the Devil’s Punch Bowl and a good part of the land that would become Vizcaya. The formal grant of land donations in 1825 represented a couple of important milestones for the area. From that point forward, the river in which all the grantees lived was officially called the Miami River. Second, the grant also represented the start of the title chain of property that will comprise the future City of Miami. 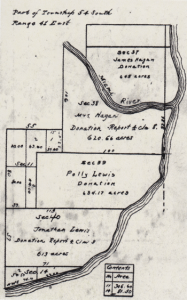 The Egan family owned the two land grants north of the Polly Lewis donation. In 1829, James Egan chose to sell his 640 tract of land for $400 to Richard Fitzpatrick of Key West. Fitzpatrick was originally from Columbia, South Carolina, and had envisioned creating a large plantation along the Miami River. In 1832, Polly Lewis was getting older and decided to sell her tract of land as well. Her buyer was also Richard Fitzpatrick. Over time Fitzpatrick would buy the other donations in the area. For a sum of $1,840, Fitzpatrick accumulated four square miles of prime land around the Miami River. The next chapter for the Santa Maria lot would not occur for 94 years following the sale of the Lewis property to Fitzpatrick. It wasn’t until the Brickells began to plat out Millionaire’s Row that the Santa Maria lot was developed. Evidence of the Lewis home would slowly disappear and be forgotten for 150 years. An archaeological dig in 1982, and another in 1994, would provide confirmation that the Santa Maria lot was indeed the location of the Polly Lewis home many years earlier. The Davol Rubber Company of Rhode Island was one of the most successful manufacturing companies of medical equipment in the early twentieth century. The company was started by Joseph Davol in 1870. His son, Charles Davol, was introduced into the business at a young age. He learned every part of the business before being given management responsibility. On July 5, 1909, Joseph Davol passed away. This immediately cast Charles as the CEO and principal shareholder. The company continued to prosper under the younger Davol, and Charles built an impressive fortune. On December 16, 1914, Charles married 17 year old Lillian A Baldwin. Like so many other millionaires from the north, Charles and Lillian decided to build their winter home in Miami along Brickell Avenue. In the early 1930s, the Davols purchased the Santa Maria lot from the Brickells to build their winter dream home. Charles Davol hired architect John Bullen and contractor J.Y. Gooch Company to build his palatial home. There was an announcement in the September 27, 1931 Miami Herald that Davol was issued a permit to build a $70,000 residence and servants quarters at 1643 Brickell Avenue. Actually, the announcement placed the home at 1644, but this may have been a typo. The mansion was built in Mediterranean revival style. 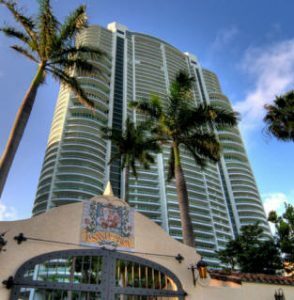 The mansion, four carriage houses, coral rock wall and the archway over the exit are all original and much has been incorporated into the present Santa Maria condominium complex. On April 11, 1937, Charles Davol passed away at the age of 69. He was admitted into the hospital and died after battling a three week illness. Although the cause of death was not in question, there was controversy with his widow, Lillian Davol. All of the major newspapers reported that Lillian had gotten re-married, in a secret reception, just five days after her husband’s death. On April 16, 1937, Lillian married Merrill Waide. Waide was a former officer in the US army and originally from California. However, he had been working in Miami as an engineer for the Vita Corporation prior to the couple’s wedding. While this may not be a big story today, news of the nuptials was carried in all of the major newspapers around the country with a tone of mid-twentieth century moral judgement. Lillian inherited the three million dollar estate following Charles Davol’s death. 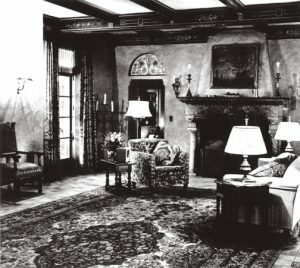 The Waides continued to live in their Brickell mansion until 1952. Merrill Waide passed away on September 4, 1949. Lillian Waide passed away a few years later on February 13, 1952. Although this article has referred to the property at 1643 Brickell Avenue as the Santa Maria lot, it wasn’t until 1952 that it was officially given the name. Luis Malaussena, a renowned Venezuelan architect, purchased the mansion from the estate of Lillian Waide. It was Malaussena that gave the mansion the name of “La Santa Maria”. Classically trained in Paris, Luis Malaussena was considered an architect that epitomized the Venezuelan architectural style of the mid-twentieth century. Employing a style that was considered neo-traditional, Malaussena excelled at adapting the style to schools, airports, medical centers and other public spaces. Seven years after the Malaussena moved into their new home, Mercedes Malaussena married her next door neighbor. Maurice Ferre and Mercedes married in 1959. Following the death of Luis Malaussena in 1963, the Ferre family moved into La Santa Maria. The family lived in the 1930s era mansion until 1980, when it was sold to a Toronto based developer. The Olympia York Company purchased the mansion and land for $6.5 million in May of that year. Olympia intended to build a 38-story luxury condominium on the land. Fortunately, the mansion, gate and surrounding rock wall were preserved during excavation of the property for the new complex. However, by the mid-1980s, the condominium market in Miami had slowed down dramatically. By 1983, a big hole in the ground was the only thing that Olympia York had to show for their $6.5 million investment. In August of 1982, archaeologists with the Dade County Historic Preservation Division were given the opportunity to survey the Santa Maria lot. The survey took place during the clearing of the lot by the construction crew. The archaeologists were given very little time to do their work given the tight timeframe of the construction schedule. The team of archaeologists and volunteers conducted salvage excavations. It was during these excavations that the team confirmed the location of the William and Polly Lewis home site. There were a number of artifacts extracted that dated back to the early nineteenth century. The artifacts were considered utilitarian and included items such as pots and jugs for storage, as well as copper buttons, iron nails and tobacco pipe fragments. According to Bob Carr in his book ‘Digging Miami’, he felt that the most “interesting feature of the site is steps cut into the rock that ascended the limestone bluff to the house”. Some of the steps were altered with concrete during the 1900s to modernize access from the top of the bluff to the bay. Despite the clearing activities and digging of the hole for the foundation for Olympia York’s project, the pre-construction archaeological work at the Santa Maria site was not totally destroyed when the project was put on hold. This circumstance provided archaeologists another opportunity to examine the site in 1994. The Archaeological and Historical Conservancy was given an opportunity to conduct a more thorough examination of a portion of the Santa Maria site. The focus of the 1994 examination was on the area near the edge of the bluff. During this examination, the archaeologists discovered a set of 56 post holes in the bedrock underneath the former location of the Lewis home. However, the post holes were dated around the time of the Lewis occupation of the property. The discovery of the post holes were four years prior to the discovery of post holes at Brickell Point that would attract a lot more attention. The Miami Circle would ultimately overshadow the findings at the Santa Maria lot. By December of 1993, Olympia York was ready to part with the property they purchased from the Ferre’s in 1980. At the same time, Ugo Colombo completed the 40-story Bristol Towers project and was looking to acquire the final piece of property for his next project. In 1993, Bristol Towers was the tallest condominium tower on Brickell Avenue. Colombo’s CMC Group purchased the Santa Maria property reportedly for $11.4 million. The Santa Maria property would be combined with two other lots to provide for the Santa Maria Condominium project. When it was completed in 1997, the Santa Maria Condominium tower was 51-stories and would eclipse Bristol Towers in height. 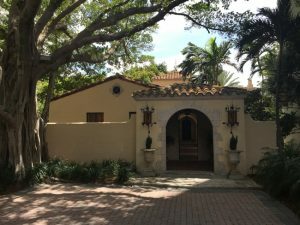 The property just south of the Santa Maria lot was formerly the location of the Roome family mansion at 1725 Brickell Avenue. The Roome family owned the property from 1920 until the mid-1960s. The mansion was most likely razed in the mid-1970s. The third lot was the property where Fort Brickell was located in 1898. The combination of the three lots would be the land footprint for today’s Santa Maria Condominiums. At the time it was completed, the Santa Maria Tower was the third tallest building in Miami. As of July, 2016, the tower does not even crack the list of the top 20 tallest buildings in Miami. As building in the area continues, Santa Maria will fall further and further down the list. 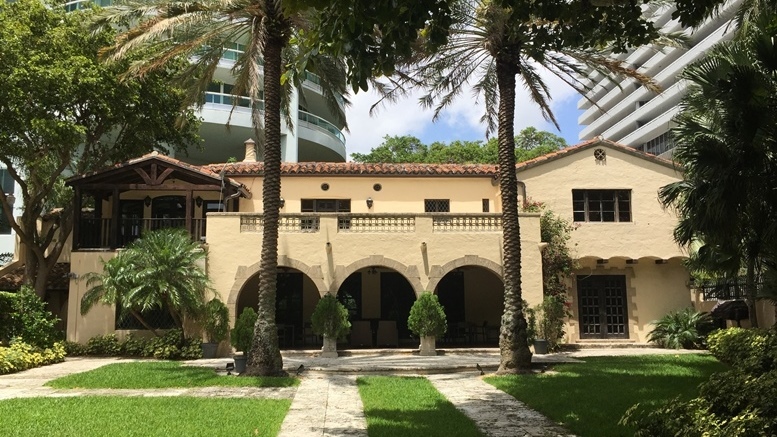 If one were to walk by 1643 Brickell Avenue today, you would see part of the exterior that was built in the early 1930s. There aren’t many structures that are still standing from when this part of Brickell Avenue was considered Millionaire’s Row. However, Santa Maria has preserved as much as can be expected given all the change in Brickell over the past 25 years. The clubhouse for the condominium complex is the former mansion. The former front entrance gate is now the exit for the complex and still proudly displays the name that it was given in 1952. The rock wall around the front of the former property is also original. If the only constant in life is change, then it is nice that Santa Maria provides a few reminders of Brickell’s opulent past. Cover Image: Back of Santa Maria Clubhouse in 2016. Figure 2: US Survey of Miami in 1825. Courtesy of HistoryMiami. 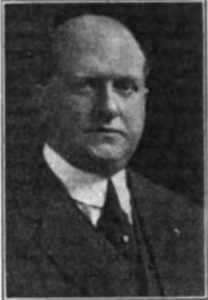 Figure 3: Portrait of Charles J Davol. Figure 4: Interior of Santa Maria. Courtesy of Brickell Homeowner’s Association. Figure 5: Santa Maria Condominium Tower. Courtesy of Brickell Condo Directory. Figure 6: Santa Maria Condo Clubhouse in 2016. 5 Comments on "Brickell’s Millionaire Row – Santa Maria"
I just love to read about the History . Great read, thank you! I just received my copy of ‘Digging Miami’ in the mail last week, excited to read it!! “Digging Miami” is an excellent read. Did you know that Bob Carr is conducting a lecture at the Fort Lauderdale Historical Society on Monday (August 8) evening from 6:00 – 8:00pm? Casey, I try not to miss any of your writings, because I always enjoy reading them, and i always learn something useful to me in my own ongoing inquiry into Miami’s history. I found it absolute genius, the way you “grounded” the story (or series of stories, some quite involved) with the use of the aerial photo as a reference point. The section of Brickell you discuss is arguably the most historical single section in all of of Miami, inch per inch. You’ve done it justice! Really tremendous work. Thank you, Paul. Your kind words are always appreciated.